I don't usually send out these promo things, however, this one was too good not to share! Click here to get the deal! Here is what you get for free for signing up. You can cancel your membership anytime. But if you love nail polish, my guess is you will be like us and become long time members. You can also skip months if you preview the items and are not interested in what's offered. or you can edit your box and select different nail polish or makeup items. I'm actuallyjealous! I want this deal myself!! And that is the reason that I am sharing this deal with you all. Leah and I have each been Julep Mavens for almost 3 years now. And we LOVe getting a new box of goodies from them each month. They have a quiz for you to take to determine your Style. I am a Bombshell and Leah is an It Girl! Leah and I had the chance to hang out with Jane and one of her staffers, Sammy. These ladies are the best! I always love supporting small business and especially Female Owned Businesses. The vision of Julep speaks to me and I really love all of their products. They are not just nail polish, but have a line of makeup products as well. They have great sales throughout the year as well. I especially love their mystery box sales. So, I used the random number generator at random.org to pick the 12 winners for my giveaway. I have 6 winners for the $25 gift certificates and 6 winners for the $10 gift certificates. $25 gift certificates winners are comments number 16, 2, 14, 11, 1 and 13 (the first 6 numbers) and the $10 gift certificate winners are comments number 11, 20, 6, 18, 21 and 12. So, Sarah, Debbie K., Laurie, Gill, Sisley and Kara M. are winners of the $25 gift certificates and Gill (lucky you! ), Elena, Linda T, Dan, Kathy and Sara are winners of the $10 gift certificates. I have sent you all emails. I have already heard back from a few of you. So check your comment number and your email to see if you are a winner and then reply back to me with answers to the questions in the email so I can get you the gift certificate, okay. I hope you all are well! It is freezing cold outside here in Michigan. So for those of you experiencing this winter blast, stay warm! I have to get back to work. Lots of packages to get into the mail today. I have 4 ready to go, and 4 more to wrap up and then head to the post office before getting the kiddos. Thankfully, the Christmas rush at the post office is over, so I won't get another gray hair waiting in line (cross my fingers, anyway!). I wish you all a cozy, creative and happy day! Well, Fall has arrived in all its glory here in Michigan. The leaves are changing and falling from the trees. The days are getting shorter and shorter and temps are cooling. We've already had a frost warning. While we all love our summer days, we do really enjoy Fall. In addition to enjoying all the changes around us outdoors, we enjoy the slowing down of our days, as we tend to spend more time at home. Much more reading occurs, as we snuggle on sofas and beds with pillows and blankets and new books. Football is on (a lot!) and my knitting needles come out. And the stove and oven are usually getting a full workout all weekend long, as the bounties of Fall harvest are perfect for slow roasting, simmering and baking. One of the gems of the Fall harvest is the apple! And they get used a lot around here throughout the Fall and Winter. I incorporate them in to roasts and soups as much as I bake with them. One of my simplest and favorite things to do with apples, besides eating them fresh (often dipped in to peanut butter or Nutella around here! ), is making fresh applesauce. Jarred store-bought apples sauce just does not compare. I love making my own also because I get to control the sugar content and I get to combine the apples with some of our other favorite fruits. I spent Sunday afternoon making batches of 5 different kinds of applesauce and took notes along the way so I could share them here with all of you today! I am a pear lover. And I just love the combination of apple's and pears. I first made this sauce over a decade ago when Leah was a baby. She loved apples and pears and we used to go fruit picking alot when we lived in New York. This is a delicate, sweet sauce that really works well on everything from ice cream and yogurt to serving along side pork and chicken dishes. This is a great fruit sauce to use in place of some of the oil or butter in baked fruit quick breads and muffins. It is also great added to apple or pear pies and crisps, as it amplify the fruit flavors. Combine the 7 cups of chopped pears, 5 cups of water and 1/4 cup of maple sugar in at medium sized pot. Bring mixture to a boil, then lower heat to a medium boil and allow to cook for 10 minutes so that pears soften. Stir mixture several times throughout as it is cooking. Next, add the 6 cups of chopped apples and 1/4 cup of maple syrup. Continue to gently boil over medium heat for another 30 minutes until fruits soften and break down and you have a nice, thick sauce. You should be stirring continuously throughout and if you need to, add water in small increments to prevent the sauce from getting too thick and scorching. Once the sauce is finished cooking, turn off heat and add the juice of 1 lemon, vanilla extract and cinnamon. Stir and feel free to add more cinnamon to taste. I leave my sauce pretty chuncky. You can run it through a food mill if you want to smoother consistency with no chunks. My husband just love plums! And so I developed this version for him. I just love the color! It is yummy alone, but especially delicious with Greek yogurt and granola on top. You could also add some to your apple pies or other baked apple dishes to amp up the flavor! Combine plums, water and suage in a medium sized stock pot and bring to a boil. Next, reduce heat to a medium boil and cook for 20 minutes. Add the apples and continue to cook over medium heat (gentle boil) for another 30 minutes. Stir throughout the cooking. Once the mixture has thickened and the fruit have soften and broken down, remove from heat and use a potato masher to break up any remaining large chuncks of fruit. Add the remaining ingredients and stir well to mix. Last Fall was our first Fall here in Michigan. We were surprised that they can grow the most delicious peaches up here! I always associated Peaches with the South (you know, Georgia Peaches), so almost did not even picked them up at the market last year. But we tried a sample and were completely blown away. I developed this sauce to use some of the delicious local peaches. Combine the peaches, water and sugar in a medium sized stock pot. Bring to a boil, stirring occasionally. Reduce heat to a medium boil and cook for 5 minutes. Next, add the apples and continue cooking for another 20 minutes until the fruit softens. Continue stirring throughout. Once the sauce has thickened and the fruit are soft, turn off heat and smash with a potato masher to break up any remaining large chunks of fruit. Stir in lemon juice and freshly grated cinnamon to taste. I never liked cranberry sauce growing up. Then one Thanksgiving in graduate school I had my first taste of homemade cranberry sauce. Wow! What difference! Homemade cranberry sauce tastes soooo much better than the canned stuff. I have several great variations of homemade cranberry sauce and one year, I decided to combine my apple sauce and basic cranberry sauce recipes together. Here is the result. About 10 minutes of prep work for cleaning and chopping fruit. About 20 minutes of total cooking time. Combine 2 cups of (rinsed) fresh cranberries, 3 cup of water and 1 cup of sugar in a pot and bring to a gentle boil. The cranberries will pop and start to cook down. Reduce to a simmer and allow to cook for 10 minutes. While the cranberries are cooking, peel and chop your apples into small chunks. Put the apples in to the pot with the cranberries, bring back up to a boil. Once boiling, reduce heat to a simmer and cook until apples soften and fall apart. The time depends on how big your apple chunks are and the type of apple you use, as some are firmer than others. Watch the sauce constantly, adding water in small amounts if needed so that it does not become too thick. My sauce was ready in about 10 minutes. Now, taste your sauce. Adding sugar to taste. We don't make ours super sweet, so the 1 cup was perfect for our taste. I do not run mine through a food mill, as we love those little bits of chunks. But if you prefer a completely smooth sauce, run it through a food mill. Mangos add a wonderful tropical flavor to applesauce. This variation is a favorite with both of my kids. Make sure your mangos are ripe but not overripe (they should be firm, but give a little when you push on the skin and you should be able to smell the fruity flavor when you sniff the skin). Combine mangos, coconut sugar and water in a medium sized stock pot and bring mixture to a boil. Stir occassionally, and once boiling, reduce heat to a gently boil over medium heat. Allow to cook for about 10 minutes, then add the apples. Stir and cook mixture for another 25 minutes. Remove from heat, use a potato masher to break up any larger chunks and stir in lemon juice and cinnamon to taste. All of these recipes make about 6 cups of fruit sauces. All of these apple and fruit sauces need to be store in the refrigerator. You can also freeze them in a freezer safe container (allow to cool to room temp before freezing) and you can can them using your favorite canning method. I usually make ours and we eat them up within a week or so! I hope you'll find some time to make some of these apple sauces. You'll be glad you did! Okay, I have to head out to get the kids. Then while they get their homework done, I'll be roasting a chicken with some veggies and will serving it with rice and some of these apple sauces! Yumm! I wish you all a happy and creative day! Finishing is going to be my Key Word for Fall and Winter! I always have something I need to finish. Always! I am the kind of maker that always has loads of projects going at once. I have always been this way. I know alot of folks that start in on one project and they work steadily on it until it is finished before allowing themselves to start anything else. That is amazing to me. Incomprehensible really! Sort of admirable as well. But I just do not function that way. Cotton Velvet bags I started almost a year ago..boy, aren't these fabrics gorgeous! Now, don't misunderstand. I get alot done. But I always have ideas running in my head, even when I am in the midst of making something else, visions of new bags, dresses, color combinations, just pop in to my head. I often drop what I am doing, get out a sketch book and throw down some notes, sketches, ideas. Or I just go and start in on that new thing, just to get it going. I usually have got to get it out of my head or I can not move on. I wanted to share a little wrap up of our summer with you all. It was full of fun and surprises and absolutely wonderful weather here all summer long in Michigan! I already shared our 4H adventure. And I shared alot of my teaching adventures as well. You can see more of my students projects on my facebook page. I still have more images to add to the album, but there are lots to see now. We took some great trips this summer, exploring Michigan. My inlaws came over from Germany for a 2 and a half week visit. We did some local things together and also ventured off to visit some other parts of Michigan. We had a great time at Muskegon Lake. I mentioned before that my mother in law is a musician. She played a little mini concert at a local church and my kids had a chance to play along with her. Here is Lucas playing organ with her. And here is Leah accompanying her on flute. I hope you all have enjoyed a fabulous summer. We sure have! It has flown by and I am sort of sad that we only have a couple more weeks before the kids head back to school. We have had family visiting from overseas, taken some great trips, visited my new twin baby neice and nephew and spend alot of time just having fun! My kids joined a local 4H group close to the end of the school year and spend a fair amount of time this summer getting entries ready for the Midland County Fair, which started on Monday. Last weekend was spend standing in lines, submitting items for judging and then putting them in our group booth. What a wonderful experience this was for the kids and I tell you, I enjoyed every minute as well. I never participated in 4H or any fairs/competitions. We are all hooked and are already planning for next year! Here is an image of our Group Booth: The Stars of 4H! And here are images of my little makers with some of their entries. Leah received a blue ribbon and a special purple ribbon for outstanding work for your fabric wall art entry. She made this in my Artistic Stitches Camp several weeks ago. As I mentioned in my last post, I wanted to share some images from our Spring Break getaway. It was a month ago, but I still wanted to share some images, as Spring has been lovely here. The temps have flopped back and forth, and we had some wet days, but that is to be expected with Spring, right? We enjoyed a week long Spring Break starting on Good Friday and the kids headed back to school this past Tuesday. We spent the first part of our Spring Break at home, enjoying a bit of a stay-cation. Well, I should say the boys enjoyed ice skating. Leah and I hung out and took pictures! We also started on the Spring Garden cleanup! This gorgeous yellowness motivated us to keep up the hard work. It has since turned green, but it lit up the backyard for a couple weeks. We have since started our seed plantings for this years veggie garden. I am also attempting to grow some flowering plants from seed as well as a load of herbs. I decided to plant an all organic, non-gmo veggie garden this year. This required that I start from seed. And in my searching, I found so many amazing seeds that I have seriously gone a bit overboard on the garden front. But I think it will all be worth it. We'll see. I will of course be sharing my gardening adventures with you all here in this space throughout the summer. We also had a little visit to my friend Denise's farm. My sweet girl with Denise's baby chicks. Denise is raising meet birds this year, and these little guys were just a few weeks old. Denise also has some egg laying chickens. My kids wanted to pack up all the chickens and take them home. The idea of backyard chickens appeals to me, but we are not allowed to have any in the part of town we live in. So we'll just have to visit Denise when they want to feed the chickens. We stumbled upon a beautiful shop....well two shops.. I just loved the building and the inside is filled with loads of amazingly beautiful things for your home as well as candles, soaps and other lovelies. I picked up some things to bring back home to enjoy and I was sent out of the store by my sweet hubby, who then came out with some gift wrapped boxes, so I am anxiously awaiting the unveiling on Mother's Day. Just 2 more days to wait! The great part about this area is that you can get in the city shopping and then with a short drive be out in the middle of nature, enjoying all of the beauty of the country side! Here we are at Sleeping Bear Dunes, which was rated the most beautiful place in the country by Good Morning America viewers. We had a blast on the dunes. It is really a spectacular place and we are already looking forward to returning this summer. On the ride to the dunes, we drove past a cute little chocolate shop. We were excited to see that it was still open on our return trip. Of course we stopped in and were greeting by the sweet shop owner and the amazine smell of the most delicious chocolate! As we shopped and chatted with the owner, we found out that she was rated the #2 chocolatier in the country by a New York Magazine. After tasting the chocolate, we could see why...delish! We also made a stop in the artsy town of Interlochen. The kids are interested in going to camp there next summer, so we figured we would check the area out. As you can see from the pictures below, it is lovely. Again, can't wait to head back in warmer weather. We are totally thinking about buying a summer cottage in this town...it is totally artsy/craftsy and has so many lakefront properties. Very tempting! We also stumbled upon a beautiful lake front spot close to Empire, Michigan. We stopped there for lunch after visiting Sleeping Bear Dunes. We bought lunch at the local pizza shop, which also happened to have the best homemade root beer we have ever tasted! They suggested this spot to us, and we are forever thankful, as well will certainly be heading back to this beautiful beach for a full day in the heat of summer! They kids found lots of new rocks to add to their collections. He wanted to go in that water soooo badly! Yes, of course, they made it into the water before we left! Well, as you can see from the pictures, we have alot of beautiful outdoor places to explore here in Michigan. We have been very pleasantly surprised at how lovely the landscape and nature is. It is not quite as heartwarming as our old hometown area in New York (yes, we still miss the Catskills, the Adirondacks, Saratoga Springs, Lake George, Lake Placid....), but very, very close! As you all can imagine, the last 5 weeks have been sort of insane...all good stuff! But insane none the less. So I have tons to share with you all, including how things went last week during my tapings for the New Sewing TV Show called It's Sew Easy that I told you all about in my last post (crazy excited about this!) and my very first blog tutorial (yes, I finally wrote a tutorial!). Let me announce the winners of the last giveaway quickly, and then on to some serious sharing! As always, I used the random number generator. I would so love to have a copy of the Elizabeth Hartman's book or the Kaffe Fasset shot cottons! So yummy! For this year I resolved to join some VQB so that I could be challenged to make blocks I probably would not have made for myself. Prize#2: comment 11...Congrats Mary P.! It's a tie between 5 and 6. I love them both! My resolution this year was to do more handwork. That could be embroidery, sashiko, applique, etc. I just feel like it is something I haven't really tried and I'd like to learn something new! Prize#3: comment 44..congrats Barbara G! Fabric, fabric, fabric! Though all the goodies are wonderful! TT collection is my favorite. Resolution? finish 3 WIPs and don't start another until they are complete! 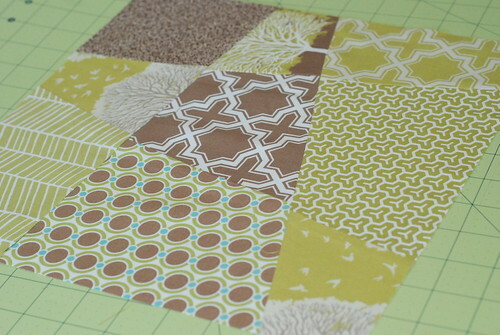 I love all the dots in the Hoot collection #5. 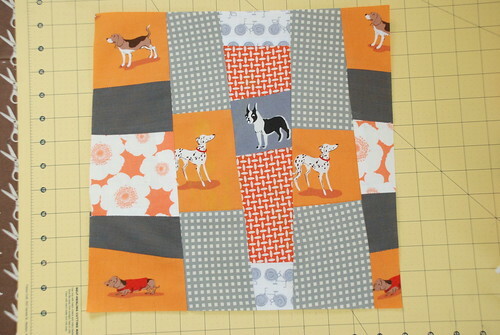 My sewing resolutions for 2011 include getting my Christmas quilts done before Dec. 1st! Prize#6: comment 2........congrats Barbara G! Congrats to you all. Please email me with your contact information so I can get your goodies off to you. Now, let me share a bit of what has been going on over the last several weeks. First, I was supposed to share this with you all a few weeks ago, but just did not have time to pull a blog post together. 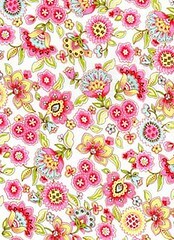 Cutie Pie Penny has two new patterns in her shop. The hexagon pin cushion is just the cutest, and I proudly own one of the pincusions made by Penny herself (thanks sweetie!). Her latest pattern is an adorable grocery bag pattern. After you finish reading this post, be sure to check out her shop! 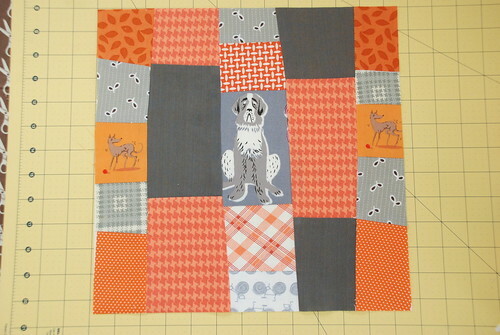 And here are the two blocks I made for the February group. Next, I am excited to say I have my very first tutorial up on the Moda Bake Shop blog (it went live on Friday)! I actually started this post on Friday to share with you and am just getting around to finishing it all up! 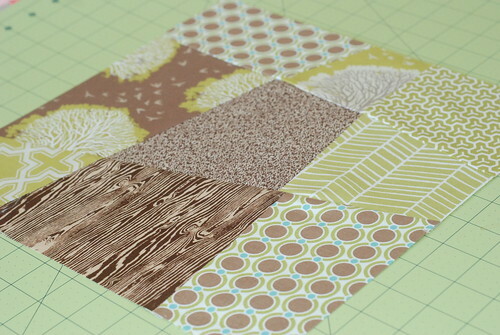 It is a DIY Party from a fat quarter bundle project and it was so much fun to put together. Get on over to the Moda Blog to read the full details and to get instructions on making all of the projects (tote bags, headbands, ponytail holdres, a confetti party banner and cupcakes!). I hope you'll love it as much as I do! The Moda Bake Shop post was in honor of my girls 10th birthday. 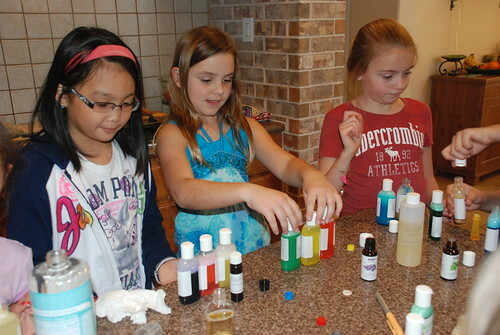 In addition to the fun DIY Party project, I had a blast organizing the party activities. 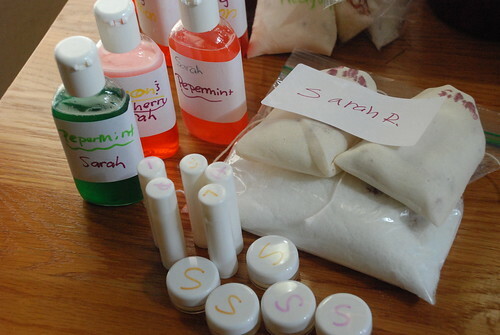 We made bath salts, bubble bath and lip balms. 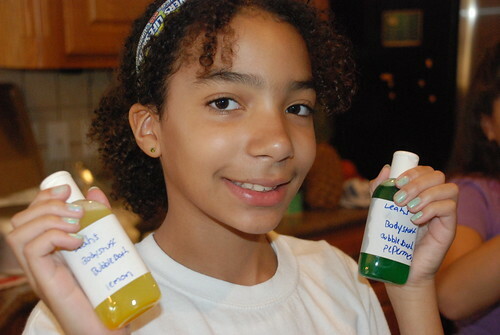 My daughter loves all this spa stuff, but I hate buying her products filled with harsh chemicals and dyes. So I thought it would be fun to show her and her friends how to make some at home. 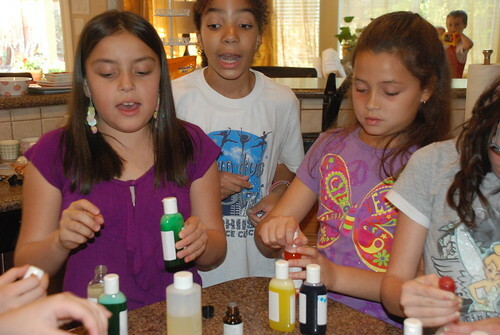 All the girls had a blast and all love mixing up the beauty products in the kitchen. Here are a few pics of them in action and of some of what they made. They put on a fun pool-side show for us! 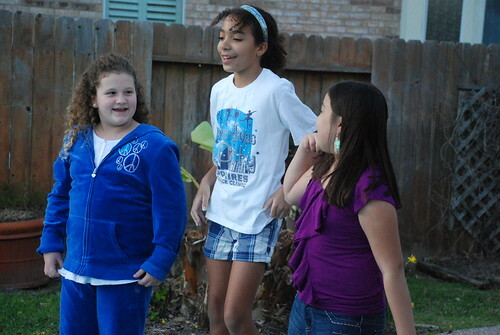 After the main party ended, 4 of Leah's closest girlfriends stayed for a slumber party. 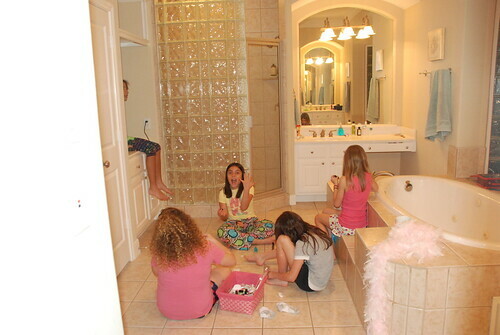 They piled up in my bathroom and painted their toenails and talked about school, music and even a little about boys (yes, I was eavesdropping big time!). Then they all piled up in her room chatted into the late night while listening to music. They slept about 6 hours and then woke up super hungry. Hubby whipped up his delicious pancakes (he is the pancake maker in our house) and the kids help me in the kitchen whipping cream and making fresh orange juice. 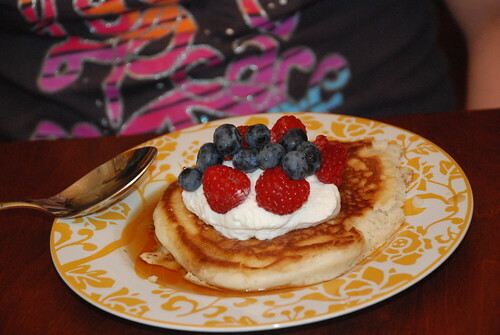 Hubby whipped up his "famous" buttermilk pancakes for breakfast. The girls and I made the whipped cream from scratch and also made some fresh squeezed OJ. Yum! 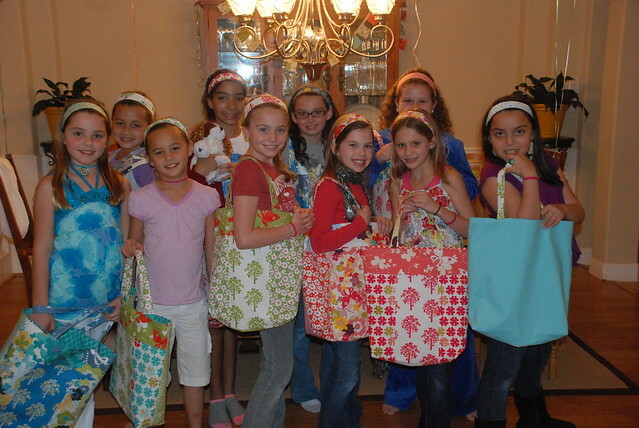 This birthday party was so much fun to put together. And I think we managed to create some really special memories for Leah and her girlfriends! I wanted to share with you all some Etsy shops that I bought some of the supplies for the beauty products, as they all provided great service! I bought the chap stick and lip balm containers from here. I bought some of the bath salt supplies and the plastic flip top bottles from here. And I bought some oils and the lip balm base here. The kids loved all the oils, especially this cherry oil. The rest of the supplies where from my local super market. If you have never tried to make your own beauty supplies, I encourage you to do so. It is such a fun and easy weekend project. If anyone is interested in my recipes/directions for making the beauty products, let me know and I'll put them together and post here on the blog. 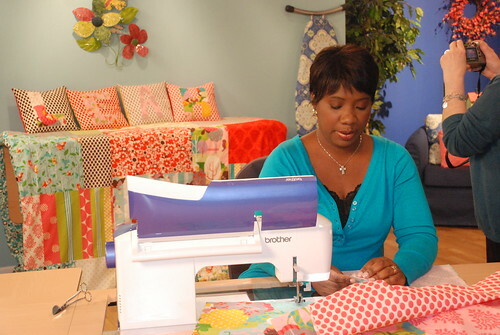 The next thing I'd like to share with you all is that I just returned from taping my three segments for the new sewing program called It's Sew Easy, which will debut on PBS this summer. O.H. My! Was that scary and fun! I think overall I did okay, especially considering I have never done anything like this before, ever. I was super nervous and super excited! And I learned a ton. I can hardly wait to get back out there in August to record more episodes for Season 2! I met so many wonderful folks at the tapings. I'll put together a full post sharing some images and sharing more details of the tapings and the shows. For now, here is a glimpse of me on set. A note on my shops...all are on vacation until I get to Michigan next week and start unpacking/setting up house and shop! I hope to have everything back up and running the 1st of April, but I may need more time..we'll see. I'll certainly keep you all posted! Speaking of the move, the packers/movers arrived early Monday morning. They have already packed over half of the house and have partially loaded the truck (our house is almost 5,000 square feet, so they have alot on their plate!). They'll continue until Thursday and then we will relax over the weekend and then fly up to Michigan on Sunday. We don't do any of the packing/loading, but are here to oversea everything and keep out of their way! It is such an excited yet sad time for us, watching our belongings get packed yet again. 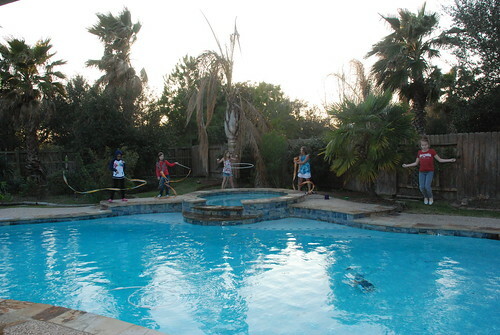 We have so enjoyed living in Texas and are just going to miss our house here and all our friends soo, soo much!! Even though this is our 3rd move in 5 years, it really has not gotten any easier. You settle in, make connections/bonds and grow to really love people and then you have to move on. I am really hoping this will be the last move for a while...we'll see. 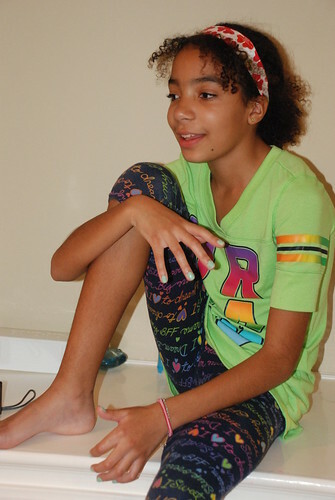 But I am staying positive, as we really found a great house in Michigan, the kids got into the school we really wanted them to attend and I even found a fab studio space around the corner from their school! We are blessed and thankful and look forward to a new life in Michigan, but will surely miss all we leave behind here in Texas. The most important thing as always is that the 4 of us are together, happy and healthy. The rest is gravy! Okay, that is certainly enough for today! I'll be back soon with more to share. Well, a big thanks to all of you for helping me celebrate my birthday and for wishing me well on my first installment of my 10 Days of Giveaways Birthday Bash! I had a great time celebrating my birthday over the weekend. I will share some pictures when I wrap up the Birthday Bash posts. I have to say, I have enjoyed reading all your comments on what you like to do this time of year. Many of you shared some great stories of traditions you do to prepare for Christmas and I have to admit I have taken some notes and what to do a few of them next year as I prepare for the Holidays. If you have not shared your comments and entered to win the first 2 giveaway items, get on over to this post and do so! Now for the next 6 items that I am sharing with you all. I have 6 charms packs to share...one from each of these collections: Dream On, Origins, City Weekends, Punctuation, It's A Hoot and Lily & Will....all collections from Moda. There will be 2 winners for this giveaway...you'll get 3 charm packs each. To enter for a chance to win one of these charm packs, leave a comment on this post telling me which was your favorite fabric collection released in 2010. If you have made something with this collection, be sure to share pictures/links with us with your comment so we can check it out! I'll close comments on this post on 12/24. I can't wait to read your comments! I wonder if anyone's favorite will be the same as mine? See you all back here soon for Day 3 of the 10 days of giveaways birthday bash! Fall 2010 Quilt Festival Review and My 10 Day Birthday Celebration Begins! I have some fun things to share with you all today. I'd like to finally share some images of my Quilt Festival booth and then I am starting off 10 days of giveaways to celebrate my birthday! Yes, today is the big day. I am officially starting my last year in my 30's! Exciting and crazy to think about...when did I get this old? I want to celebrate with all you lovely blog readers and customers! So be sure to make your way to the end of this post to see the first isntallment of my 10 days of giveaways birthday celebration! First....My Houston 2010 Quilt Festival Booth and some of the lovely folks I met. Me with Angela of the Moda/Bake Shop. What a gorgeous sweetie pie she is! I was so happy to have been able to meet her in person! Me with Safieh and Amy of the Houston Modern Quilt Guild. So let me move on to my Birthday! So those that know me well know that I.o.v.e birthdays. I love celebrating birthdays. I love giving birthday gifts. I love cake. I love it all! I have never really done a big celebration of my birthday on the blog. But this year I will! So, since I am now 39, I will be giving away 39 things over the next 10 days. I know. Isn't this fun!! I will kick off the celebration today with 2 of the 39 prizes. 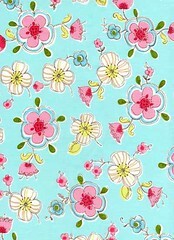 One lucky person will win an autographed copy of Amy Butler's new book Style Stitches. I visited Amy at her booth at Quilt Market and picked up a box of her books to sell at Quilt Festival. Me with the always cute and fabulous Amy Butler. She kindly signed them all and off course they sold out very quickly at Festival. Luckily I put one aside and decided to hold it to share with one of my blog readers. I love this new book and it is just filled with one amazing, gorgeous bag after the next. I have a signed copy of my own as well and have already tagged half the book as must do projects! Along with the book, the winner will also get a $20 gift certificate to my online fabric shop so they can buy some fabric to make a bag from the new book. To enter the giveaway, simply leave a comment on this post telling me what's your favorite thing to do this time of year? Of course for me, in addition to celebrating my birthday, I love to prepare for Christmas! I love going out and picking the tree. I love driving around and seeing all the decorations. And people are just often in such a cheery mood! I always feel lucky to have been born during such a festive time! This giveaway, and all the giveaways for my birthday celebration will end on Christmas Eve. I'll close the comments that morning and then will announce winners shortly after. This will give everyone plenty of time to get here and enter for a chance to win. Plus, that way, I don't have to worry about shipping anything out until after the Holiday rush (I know, I am so clever, aren't I! ).